ABE is a smart protective cover for your 3D printer that senses and adapts to the surrounding environment to provide optimal internal printing conditions. ABE also provides a universal means to control the entire 3D printing process remotely and integrate your 3D printer into a larger network of interconnected devices. Is ABE a heated enclosure? No. ABE is a universal rigid smart cover that is designed to be easily removed for required maintenance procedures. A sealed hatch is provided for easy access to prints. It does not include any heated elements to control the internal build environment. Instead, ABE uses much more efficient selective convection technologies to maintain optimal print conditions while using the existing processes heat from the printer. How does ABE control the build environment? ABE uses an array of sensors to actively record the temperature, pressure, humidity and vibration forces from several different locations in the build environment. ABE then uses that data to find any suboptimal build conditions and attempt to fix them automatically. If they cannot be automatically corrected then ABE will alert the operator of the issues while simultaneously logging sensor data in real time to ease troubleshooting. What issues can negatively affect the build environment? Temperature gradients are one of the most pervasive issues, particularly when printing in ABS. This can cause unsightly warping or cracks in prints and lead to premature failure of the printed part. Humidity and vibration issues are also very widespread across 3D printer designs. High humidity can cause bubbles and blow outs in printed parts by absorbing into the filament while sitting on the spool in open air between prints. High vibration levels can cause striations in prints and require printer components to be recalibrated prematurely. ABE will help diagnose and/or solve all of these 3D printing issues, regardless of the printing platform being used. Control everything from anywhere, instantly. 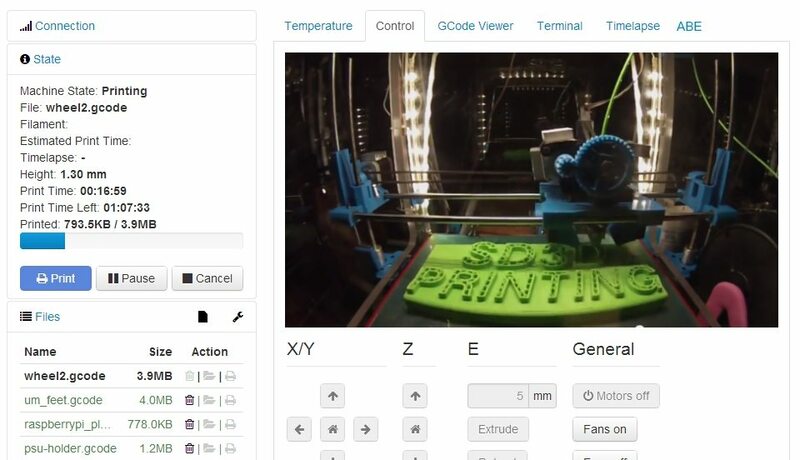 ABE now comes preloaded with a customized SD3D distribution of OctoPrint, the open source web based 3D printer host. This interface can be accessed from the ABE unit itself via an embedded 4.3” LCD touchscreen display or through a common web browser accessible from your laptop or smartphone. With Bluetooth and wifi connectivity built into ABE, 3D printing is seamless and simple from just about any device on your network. 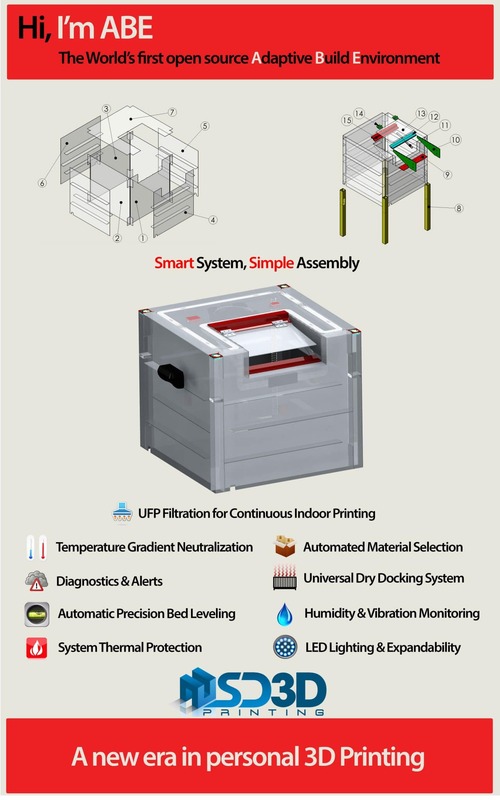 In additional to having all of the standard printer control and system feedback features you expect in your 3D printer host, all of the ABE sensing data and environmental controls are also at your fingertips for real-time monitoring of temperature gradients, humidity & vibration levels, ambient temperature, HEPA filtration status, remaining spooled material and critical system alerts. A broad spectrum of sound frequencies are even monitored allowing ABE to listen for any other failure mode that falls through the cracks (pun intended). Live streaming 1080p video and email/text alerts are also available, providing the ultimate remote 3D printing experience. Intelligent cloud slicing through Layer3Dcloud. Printable gcode or stl files can be loaded onto ABE wirelessly via Bluetooth, wifi or directly through SD card, USB drive or just about any other portable storage device. ABE provides the latest version of Cura as the onboard manual slicing program. We have also developed a subscription based cloud slicing service called Layer3Dcloud which automatically monitors the precision bed height calibration and printer specific material settings for each ABE server connected to the network. This allows users to upload 3D files in up to 17 different common formats and have the files seamlessly sliced into gcode using precisely calibrated system specific material settings. The gcode is then sent directly to their idle printer for immediate printing or placed in the queue if the printer is already active. ABE actively monitors which printer and materials it is currently serving so there is never any worry about matching the correct material settings to the destination printer. By automating this, the Layer3Dcloud slicing process takes just seconds as verifying system specific settings is no longer necessary. The user simply selects which of the loaded materials to use, the desired resolution, infill and quantity; ABE takes care of the rest. Print quality and reliability is further improved by ensuring the correct material/printer specific settings are used on every print. Whenever ABE detects a new printer-material combination, it will prompt the user to run a quick calibration print and provide simple feedback based on the actual print results in order to immediately generate precise printer-material specific settings. This process only has to be done once for each printer-material combination. ABE will then actively track any print failures and send diagnostic data back to our servers to be analyzed by self-learning algorithms designed for continuous improvement of the cloud slicing quality. Temperature gradients within the build environment are the main contributing factor of warping and cracks in 3D printed parts. This is particularly true when printing with ABS which has a relatively high rate of thermal expansion. ABE takes care of this problem by actively monitoring and adjusting the build environment to neutralize drafts and temperature gradients. By utilizing four high precision temperature sensors, ABE actively controls the temperature of each zone making sure that gradients never exceed two degrees throughout the build environment. 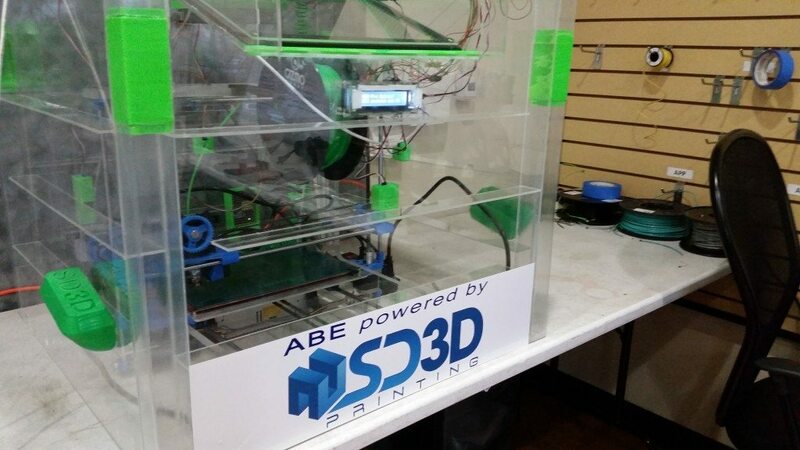 ABE provides universal diagnostics for Rep-Rap style 3D printers. This allows novice and intermediate operators to quickly troubleshoot environmental issues which can have a drastic impact on the outcome of the final printed product. Data is plotted against historical averages to quickly highlight the source of an issue and provide suggestions for fixing it. Emergency alarms are also provided while a print is in-process to help the operator prevent a failed print before it occurs. Bed leveling and height management are increasingly becoming standard options on commercially developed 3D printers. ABE brings this functionality to Rep-Rap printers in a package that is scalable to just about any bed size you may be printing on. With a resolution of 10 micron and tolerance of less than 1%; ABE provides a level of precision that is unprecedented on printers retailing under $10,000. LED lighting is provided to internally illuminate the build environment during prints. We have designed the lighting to provide an even distribution to the print so that you are able to capture excellent footage when filming your prints. With all this technology inside ABE, we needed to make sure that everything stayed organized and in its place over time. Cable trays have been carefully designed to make organizing and routing cables around the build environment easy. Since ABE is not a permanent enclosure, this is an important for being able to easily remove the cover for periodic printer maintenance. 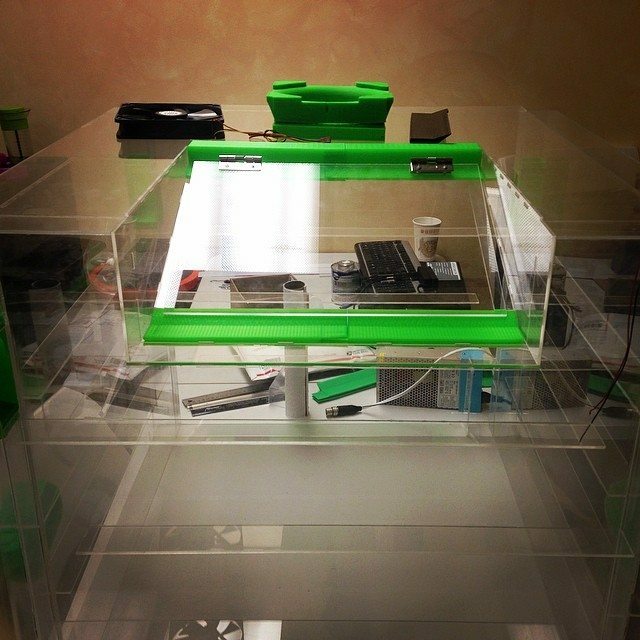 Toxic fumes and obnoxious stepper motors are no longer an issue when printing with ABE indoors. An internal ventilation system filters the air inside the build environment utilizing a reusable UFP filter. This filter captures all of the toxic particles so that when you open the hatch to remove your parts, the inside smells just like the rest of your room. A pressure sensor is used to let you know whenever the filter needs to be cleaned, no guessing involved. Furthermore, ABE reduces audible printer noise by nearly 20 dB! When the lights are off, you won’t even know there is a printer in the room. Overheating is one of the most devastating issues you can encounter in a 3D print. For this reason, ABE includes a thermal protection circuit and aluminum heat sinks to keep your printer cool for the long haul. This circuit is specially designed to cool the stepper drivers without inducing a temperature gradient within the build environment. The steppers themselves are passively cooled with properly sized heat-sinks to reduce errant convection within the build environment while keeping your equipment adequately cooled. If you ever wonder why you need to repeatedly calibrate your printer, chances are you are dealing with a relatively high level of vibration. If your printer is not properly maintained, these vibrations can get worse over time, leading to print failure. ABE monitors internal vibrations and records data in real time. If a high level of vibration is present the operator will be alerted with suggestions regarding a possible fix. We never forget that old saying: an ounce of prevention is worth a pound of cure. An additional I/O board is included with the deluxe model to allow for future expansion of additional sensors and USB inputs. Even when fully loaded with a camera and 3 dry docks, ABE has two additional open USB ports for future expandability. Additionally, ABE includes an optional Go-Pro mount for internal filming which was designed to take advantage of the optimized LED lighting. Go-Pro cameras happen to have the same maximum operating temperature as ABE, so you never have to worry about your camera shutting off due to high temperatures. This automates the high precision bed leveling system so that you can simply press a button and walk away during bed calibration. ABE completes this process in less than five minutes by utilizing several stepper motor controllers and multiplexers to control each stepper independently. That leaves you just enough time to brew your cup of coffee before the first print of the day. ABE utilizes an RFID reader to recognize what material is being loaded and keep track of how much material is remaining. When a new spool is loaded, ABE recognizes it immediately and displays the material code and remaining material volume in a new window. This allows the operator to quickly select the proper material settings and determine if there is enough material to complete the pending print. Friction from improper spool mounting can cause layer shifts and defective parts. Since material manufactures sell spools in a variety of dimensions and geometries, ABE includes a universal dry docking system. This includes an internally sealed compartment, two guide cylinders for the spool to rotate on and renewable desiccants for humidity management. ABE can accommodate up to three dry docks paired with the automated material selection system.